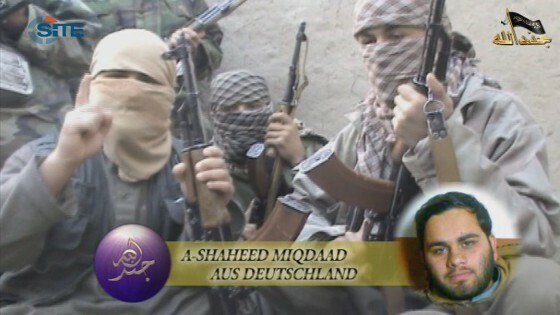 Image of “Abdullah from Essen,” a German citizen from Afghanistan who was known as Miqdad, from an IMU martyrdom videotape. Image courtesy of the SITE Intelligence Group. A German citizen who fought with the al Qaeda-linked Islamic Movement of Uzbekistan was killed by US troops during a recent clash in Afghanistan, according to the terror group’s spokesman. “Abdullah from Essen,” a German citizen from Afghanistan who was known as Miqdad, was killed while fighting US forces in northern Afghanistan, according to a martyrdom statement. Yassin Chouka, a spokesman for the Islamic Movement of Uzbekistan who is better known as Abu Ibrahim al Almani (“the German”), made the statement in a videotape released on jihadist websites. The statement is titled “The Afghan Lightning” and was translated by the SITE Intelligence Group. Miqdad, who was nicknamed “Afghan Lightning,” first arrived in Pakistan’s tribal area of Waziristan in November 2010. “In 2011, he concluded his training in a training camp, and traveled shortly after that to northern Afghanistan,” the IMU said. Miqdad was killed during a clash with US troops on March 23, 2011 in Baghlan province. Miqdad also makes a brief statement in his martyrdom tape, in which he encourages Muslims worldwide to flock to Afghanistan and Pakistan. German jihadists flock to both the Islamic Movement of Uzbekistan and its splinter group, the Islamic Jihad Group (or Islamic Jihad Union). German leaders and fighters occasionally are killed or captured in Afghanistan and Pakistan. The Islamic Movement of Uzbekistan is an al Qaeda-affiliated group whose leadership cadre is based primarily in Pakistan’s Taliban-controlled tribal agency of North Waziristan. The terror group operates primarily along the Afghan-Pakistani border and in northern Afghanistan. According to one estimate, more than 3,000 Uzbek, Central Asian, and other foreign fighters belonging to the IMU are sheltering in North Waziristan. Top leaders of the Islamic Movement of Uzbekistan have integrated into the Taliban’s shadow government in the northern provinces. Operating in conjunction, the Taliban and the IMU have expanded their presence throughout northern Afghanistan, and have established training camps in the region. ISAF has identified the presence of camps in Sar-i-Pul and Samangan provinces, while Taliban leader admitted the IMU has established camps in Kunduz. The IMU’s former leader, Tahir Yuldashev, was killed in a US Predator airstrike in South Waziristan in September 2009. Yuldashev sat on al Qaeda’s top council, the Shura Majlis. He has been replaced by Abu Usman Adil. German Muslims make up a significant portion of the Islamic Jihad Group. Its fighters are often referred to as German Taliban, and they carry out attacks in both Afghanistan and Pakistan. In 2009, the Islamic Jihad Group released video of ‘German Taliban villages’ in Waziristan. Its fighters were seen training at camps and conducting military operations. The US killed Najmuddin Jalolov, the leader of the Islamic Jihad Group, in a Predator airstrike in North Waziristan on Sept. 14, 2009. Several prominent German jihadists have been killed or captured in Pakistan and Afghanistan over the past year. On April 28, 2010, Eric Breininger, a German member of the Islamic Jihad Group who was wanted for his involvement in the failed plot to attack US military facilities in Germany in 2008, was killed in Pakistan. On May 10, 2010, Bekkay Harrach, a German national from Bonn, was killed while leading an assault on the Bagram Airfield in central Afghanistan. Harrach, who was also known as Al Hafidh Abu Talha al Almani, was also a member of al Qaeda external operations committee. In July 2010, Ahmed Siddiqi, a German from Hamburg, was captured in Kabul, Afghanistan. Siddiqi disclosed a plot to carry out Mumbai-styled terror assaults in Europe. Last fall, several Germans were reported to have been killed by the US in Predator airstrikes in the Mir Ali area of North Waziristan. The Germans were thought to be training for attacks in Europe. Both the Islamic Movement of Uzbekistan and the Islamic Jihad Group are known to run camps in the area. And on May 9, ISAF captured a “‘Germany-based Moroccan al Qaeda foreign fighter facilitator” in Zabul in southeastern Afghanistan. Europe and American political leaders need to pass simple federal laws that make it a ‘capital offense’ in their respective countries for any so-called citizen joining any terrorist organization and/or traveling to Pakistan or any conduit country with the intent on joining a terrorist organization (of any kind). Instead of playing ‘cat & mouse’ games with Pakistan or any other state-sponsering terrorist country, we need to capture and hold these soc-called ‘citizens’ for questioning before they get into the Jihadist pipeline. Second, we need to ‘infiltrate’ local madrassas and mosques in Europe, the Middle East, Indoesia, Maylasia, and especially Pakistan and ‘identify’ these local and visiting Imams who preach ‘Jihad’ and/or look to ‘recruit’ impressionable young Muslims and then make it a federal crime with very serious consequences. These people LOSE their right for ‘democratic’ expression when their INTENT is to KILL in the name of any religion or secular cause. Third, all so-called ‘citizens’ captured on the battlefield or enroute to a battlefield should be considered combatants regardless of whether they are wearing ‘combat uniforms’ since we know they don’t wear any or their combat uniform is whatever guerilla fighters normally wear as a irregular force. These combatants should then be tried before a military tribunal and then ‘executed’ as a(premeditated) murderer of innocent men, women, and children within 90 days of their capture. The ‘political correctness’ of this age must come to a STOP because drastic actions by state sponsored murderers call for drastic measures. Do we wait like ‘ignorant fools’ until Islamic extremists states or countries use their proxies to intimidate and assassinate duly elected government leaders who do NOT aspire to their Jihadist callings. I think not. Worst, do we wait like ‘ignorant fools’ until these same proxies ‘explode’ an nuclear weapon in Tel Aviv which would create a nuclear response from Israel against neighboring Islamic terror states of unimaginable magnitude. Curiously he died in Baghlan province and Bekkay Harrach died at Baghram. One wonders if an Arabic to Latin transliteration error moved Harrach to a nicer location? The Bundeswehr is in Baghlan (they had another KIA this week). Seems like the sort of area the IMU German’s would like to fight to stick it to the German Army? the question i ask myself is why does germany allow these foreigners to enter and live among them? what is the meaning of immigration? germany have enough people to go around. what made him better than a real german? we will never know will we? uh oh, osama is on to us. how did you get so smart?